Besides style, Joyce is seriously talented at blog design! She is the one responsible for my recent blog revamp, and didn’t she do an amazing job?!?! For me, changing things up was a little scary (I’m not so good with change…ha!). Joyce did an amazinggggg job of kindly guiding me through the process and REALLY listening to my ideas, bringing them to life here! Find out more about Joyce’s blog design HERE!!! oh my goodness she is so cute and i want to steal her jacket!!! and i think everyone like to wear a&f at one point. haha i still like some of their things (mostly jeans) but they're sooo expensive! Thanks for introducing Joyce! Your outfit is absolutely adorable, and I'm glad to have found your blog through this post 🙂 Have a great day! Haha, I only shopped at Hollister as a middle and even high schooler too. I would've never gotten rid of this dress either! So cute! I honestly think Hollister and Abercrombie clothes are really, really cute. Problem is, they're WAY overpriced and they have their logos are on everything! I am SO happy that you introduced us to Joyce. I've been looking to redesign my blog as well. Everything you see on there now has been homemade by yours truly. Lol. Except for the illustration on my header. That was done by a very nice girl from Vietnam, Hanh Le. Hahaha, and oh man, soooo many "witty" tees that I've owned. Most are gone now, thank goodness, but yeah, there were a few Bobby Jack shirts in 7th grade…sigh. Anyway, I saw this outfit and wondered "what part is the Yeah I Really Own That? 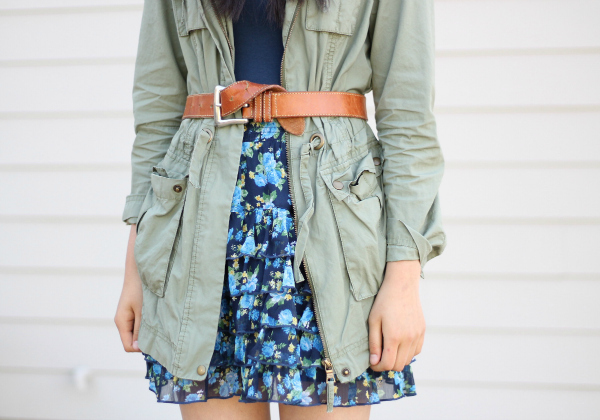 This entire outfit is just adorable!" Yet another example of Joyce's layering skills. Adorable outfit dear ! Great choice ! Hi Ashley! Just found your wonderful blog through Joyce! Would you like to follow each other on GFC, Bloglovin, and Facebook? hehe, I happen to have a similar dress actually 😛 I remember those were really "in" a couple of years ago here in my country and I totally needed it (yeah right). now it's hiding in my wardrobe and I haven't worn it for years I think.. anyway, I really like it how the dress matches those shoes! What an awesome combo…I love her little blue booties! I love her style! It can be so unexpected, yet so perfect! Haha, I'm glad that I'm not the only one who would just love to steal her ideas. I just love her outfits! She always makes something new and exciting with pieces I've seen her wear before. I adore you, Jooyyyceeeee! I love how she belted her jacket here. Haha good old abercrombie and hollister. I remember those days! But hey, this dress is actually pretty cute and you managed to cover up the deer/bird that gives away its origin with a super cute jacket and belt combo! I had so much Abercrombie too! It was THE thing to wear back in the day haha! Love your dress Joyce – floral is always in! You would never guess that this was an Ambercrombie dress from the way you wear it, Joyce! Even your old items are cute, not fair! Joyce is the best, she designed my blog layout as well! Adorable outfit. First, I love the idea of this series! I have probably way to many things that fall under this category! Joyce is the cutest and I actually think the dress is really pretty! I had the same idea of those shops being so cool and trendy growing up haha! I've loved following her blog as well and she really is so so sweet! I agree that she's amazing at mixing prints…I'm so jealous!